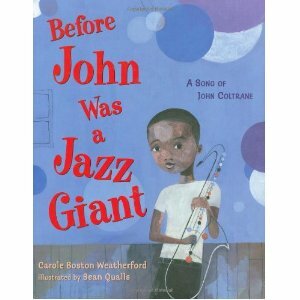 This non-fiction children’s book is creative biography of the childhood of John Coltrane, of one of the greatest jazz musicians of all time, who first had to listen to great music before he could write and play music of his own. This Notable Social Studies Trade Books for Young People of 2009 in the category of biography presents the childhood of Jazz great John Coltrane with a primary focus on the musical sounds of his childhood. The book explores some of the inspirations for his desire to be a musician and the people, things, and music that influenced him. Each page is filled with beautiful, mostly abstract images in muted shades and limited colors. An author’s note at the end of the book provides a more detailed biography that parents, teachers, and librarians can use to answer questions from children who want to know more about Coltrane. There is also a list of some of Coltrane’s music available on CD and a list of books and a website about Coltrane’s life. 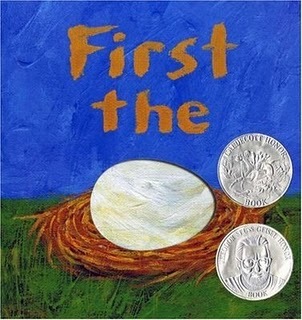 This book presents the concepts of how first there is an egg and that egg becomes a chicken. Then the story depicts other “firsts” that occur in nature: first tadpole, then frog; first seed, then flower, etc. Then a different process emerges: first there is a word and then there is a story and then there is an artist who paints the story and a writer who tells the story which leads back to the egg which is now the second part because first there is a chicken and then there is an egg. This winner of the 2008 Theodore Seuss Geisel Honor and the 2008 Caldecott Honor has a fairly simple story that begins with a particular of which came first the chicken or the egg? There are a variety of cut-outs that by turning the page reveals a connection. The egg leads to a picture of a chick; a tadpole cut-out leads to a frog, and other progressions within nature are depicted. The illustrations are a rich palette of colors that appear to be painted on canvas. The most ingenious aspect of the story comes near the end when the reader discovers the story they are currently reading is part of the story they are reading. Children may be too young to appreciate this clever bit of metafiction, but it may plant the seed in their minds about the complexities of writing stories as well as reading them. An illustration at the end of the story incorporates the animals and objects mentioned before. Seeger proves herself to be a masterful artist and storyteller using the picture book form. Just when the reader thinks the book verifies that the egg came first, the story ends with the chicken laying the egg. 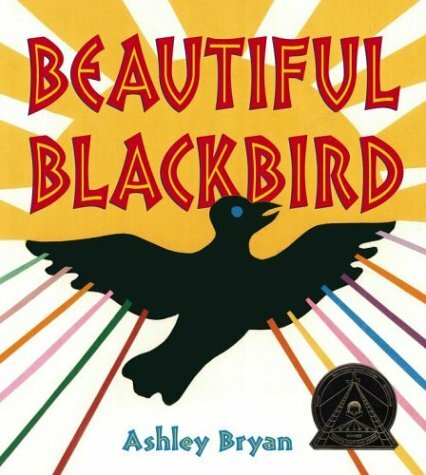 This is the story of Blackbird who was voted as the most beautiful bird in the forest and the envious birds who want to be black, too. This winner of the Coretta Scott King award for 2004 is an adaptation of a folktale from Zambia. Blackbird is considered the most beautiful, so all of the other birds who are in different colors want to be black too. They ask if Blackbird can make them black, but Blackbird tells them that what counts is how they are inside. Blackbird mixes up a batch of blackening and gives everyone marks or designs in black. This book is a celebration of the beauty of the color black. The captivating illustrations resemble shapes cut from colored paper placed together in a collage. The book has the positive message that beauty comes from pride and confidence. A little boy playing on the beach discovers a camera that has washed ashore. He has the photographs developed and discovers that a strange world exists beneath the sea. This Caldecott Medal winning wordless book features a collection of visually stunning illustrations that can captivate both a child and an adult’s imaginations. A boy playing on the beach follows a crab into the water and is caught up in a powerful wave. He then discovers that an underwater camera has washed ashore. The boy decides to take the film into a shop to be developed, and then his adventure begins as he views the wild assortment of photos. The photos depict normal sea life mixed in with some unusual creatures engaged in extraordinary behavior and activities as well. 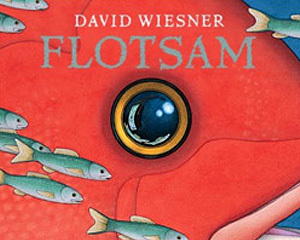 This wordless book can provoke a child’s imagination to invent a story of why an octopus is sitting in an armchair reading a book, and why there are a series of photos of children holding up pictures of other children from various periods of time. Most of the illustrations are in the bright colors that capture a sunny day at the beach. The underwater pictures are drawn in darker colors, yet the images are clearly and vividly depicted. A few illustrations in black and white add to the mysterious mood the book provides. This is a perfect book to spark a storytelling session. Even the littlest of children can find an image within this book to make up a brief story. This book explains what life at home is like when you have a pet elephant who thinks he’s a cat. 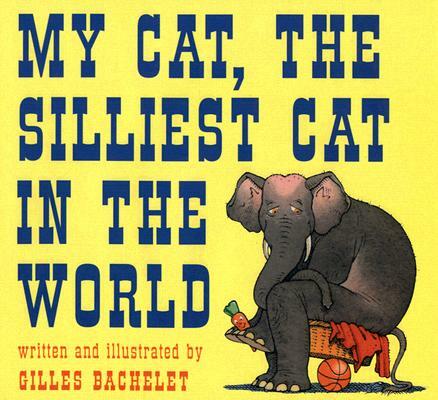 This international award winning book is a delightfully silly story that convincingly presents the behavior of an elephant who for some unexplained reason believes that he is a cat. He uses a small litter box, sits on top of the TV, and sleeps in the dryer. The illustrations are in bright vibrant colors that highlight the silly behavior of an elephant who is just too big to utilize the objects and spaces used by cats. The illustrations are the highlight of the story, depicting the elephant compensating for his large size. There are also nine small illustrations of elephants with the colored fur patterns of real cats. This book will keep parents and their children entertained with the creative goofiness of it all. There was a sequel called When My Cat Was Small that has unfortunately gone out of print. Bachelet, Gilles. Mi Gatito Es El Mas Bestia. Molino Editorial, 2007. Animals engaged in various alliterative activities designed to help children learn the alphabet. This installment of the popular “Cows that type” series is an alliterative alphabet book that will delight toddlers and preschool children. The letter C is of course devoted to the “clickety-clack” of the cows typing. There are also “duck dashing,” “eggs emptying,” and “inchworms inching.” There is a bit of a plot, since the animals are all racing to a picnic. At the end they all fall asleep, which is characterized by the letter Z, as in “ZZZZZZZZ.” It’s a quick and fun read which will provide joy to a child learning the alphabet. The illustrations feature highly animated creatures who are mostly engaged in the process of running. There are lots of amusing details to keep a child interested in following the story while learning the letters of the alphabet and new words, as well. 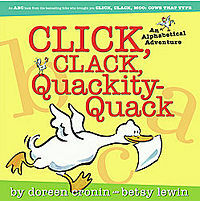 Cronin and Lewin won the Caldecott Honor for Click, Clack, Moo: Cows That Type in 2000. Click, Clack, Quackity Quack is equally entertaining. Three little girls are left alone at home when an old woman comes by claiming to be their grandmother. She doesn’t look like their beloved Po Po. The three little girls have to find ways to outsmart this wolf. This version of the familiar tale of the little girl dressed in red who visits her grandmother in the woods has many interesting variations to the beloved story. 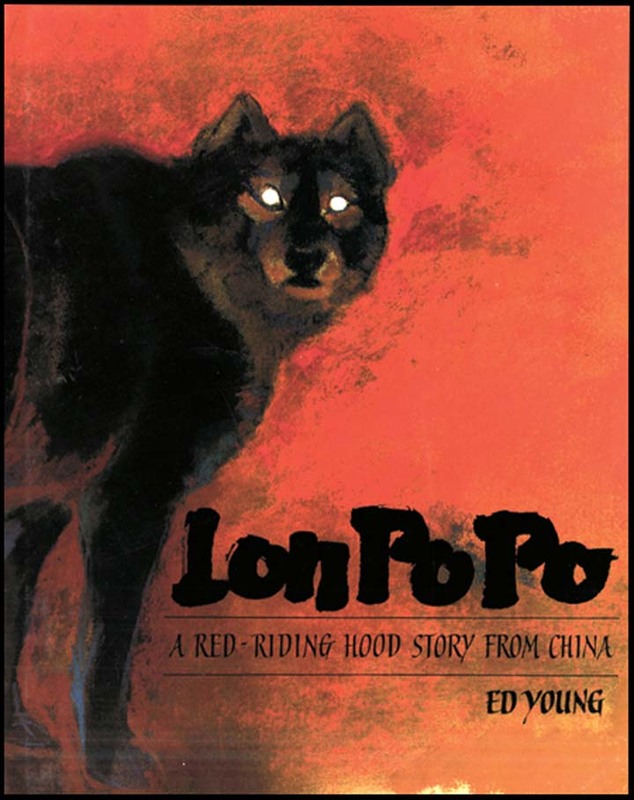 Instead of one girl, there is a trio of sisters who are at home when the wolf comes to visit disguised as an old woman and claims to be the girls’ grandmother or “Po Po” and asks to be let into the house. Like the more familiar Little Red Riding Hood, these girls are not fooled by the hairy deep voiced woof. The illustrations are a mixture of watercolors and pastel with the techniques of Chinese panel art. This version offers the standard warnings about strangers and using one’s intelligence and powers of observation to recognize danger, but it also adds the element of working together and relying on your familiar to help you to avoid harm. This is a perfect book for children who love the Little Red Riding Hood story and is an excellent way to make them aware of other cultures who share their familiar stories. When she is asked to share her toy with her sister, Sophie gets really, really angry and runs away. In this multiple award winning book, including the Caldecott Honor, a little girl named Sophie explodes with rage after her sister snatches her toy gorilla away and causes her to fall on to a toy truck. 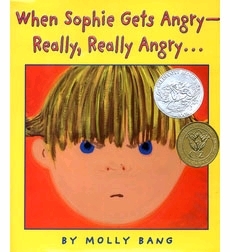 Sophie has an angry fit which is demonstrated via an explosive rage illustrated with bursts of color and words formed into shapes of fire and volcanic eruptions. After she wanders away from home, she finds soothing comfort by climbing a tree and feeling the calming forces of a breeze and the sound of the waves from the ocean view. This book explores the natural process of anger and our ability to overcome it. The illustrations are a mix of vivid and saturated colors which emphasize Sophie’s array of emotions as the story progresses. This is a wonderful book for children and adults to discuss emotions and feelings of fairness or lack of fairness with the concept of sharing. A little girl and her family are depicted in the many different types of light that are visible at night. 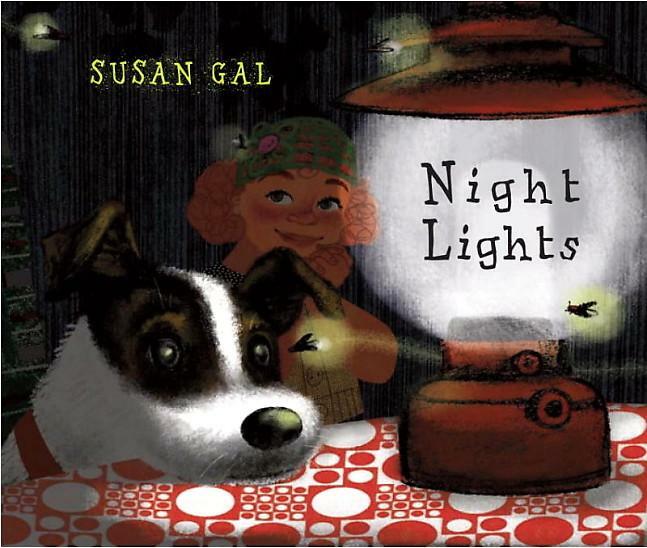 Illustrator Susan Gal makes a stunning debut with this nearly wordless book that simply has words or compound words about some of the types of light, including “streetlights” and “porch light,” that we encounter every night after the sun sets. There are wonderful vignettes of family life and normal activities that require a light source. The highlights include a dog’s birthday party complete with a birthday cake with a dog bone design with the single word “candlelight.” The illustrations are rich with detail capturing the mysterious world of the night. There is also a wonderful use of shadow and illumination. The book ends with “night-light” “moonlight” and “good night” which makes it a perfect bedtime book for toddlers. This book explores the wondrous things happen on Halloween night, including a party at the Haunted Hall. 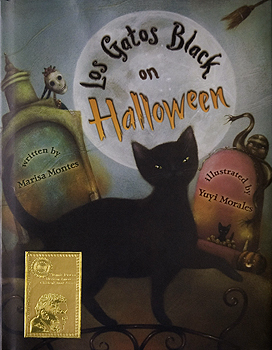 This Pura Belpre Honor Book winner of 2008 is the captivating story of both real and imaginary creatures that are associated with Halloween. It’s not surprising that artist Yuyi Morales is a multiple award winner. The illustrations are stunning, lush with details in deep dark colors, and are both scary and whimsical. Each two page illustration depicts Halloween night creatures, including black cats, werewolves, well-dressed skeletons, and witches of all shapes and sizes as they head for a ball being held at a haunted mansion. The illustrations are the main point of reading this book, so be prepared to stop for a few minutes on every page. The story is wittily told, and what makes it additionally intriguing is that there’s a Spanish word or two in every sentence. There’s a glossary of Spanish words at the back of the book because the Spanish words are not translated in the text of the story.